Just when you think you have seen every possible fundraising idea ever, someone comes up with a new one. Some crazy, but kind souls in Pittsburgh are going to jump into the mon (Monongahela river) to raise money for the Circle C Youth and Family Services which is a great organization that has been supporting kids and families for over 40 years. 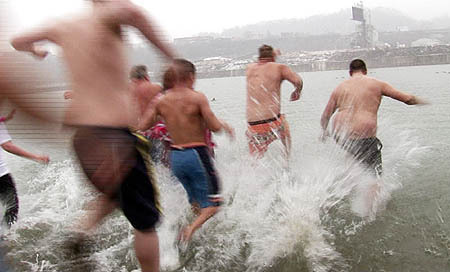 The Post-Gazette has a video report of last year’s Drowned Hogs Day Swim here. It is pretty funny to see, but it is great that people are willing to go to such great lengths for a good cause. 18th Street Boat Ramp on the South Side of Pgh. at 12:00 noon on Saturday, February 2nd. Do a COOL THING for charity & assist “Phil” to predict Spring’s arrival. GROUPS HAVE FUN COMPETING AGAINST EACH OTHER – at the 18th Street Boat Ramp on Saturday, February 2nd, 2008, South Side! Join Monongahela Mari, the Mayor of Hogdom and the “Pitts-burrrrgh Drowned Hogs” as they assist Phil in predicting Spring’s arrival! Enjoy a cup of java and the best donuts in da ‘Burgh (from Ken and Al at Bettermaid)! After the swim, warm-up with the rhythm and blues of Tracy Lee at Folino’s Restaurant located at 1719 East Carson Street.